Prescribed fire is one of the more effective and cost-efficient means of managing vegetation for multiple purposes, including hazard reduction, ecosystem restoration or maintenance, silviculture, and others. In general, prescribed fire is an effective tool in areas with fire-adapted or fire-dependent vegetation that has evolved with fire. Prescribed fire is also used to a lesser extent as site preparation in rangelands (i.e., preparation for chemical application for eradicating invasive species) or post-harvest clean-up in forested systems. Prescribed fire carries inherent risk, as fires can escape the prescribed perimeter or produce hazardous smoke if not managed correctly. Prescribed fire also varies widely in cost because of terrain, weather, and the spatial pattern of fuels, meaning that its application is not always economically feasible. Implementing and maintaining a prescribed fire regime, therefore, requires properly trained personnel, adequate resources, and the willingness on the part of the landowners and nearby communities to accept the costs and potential disadvantages of prescribed fire in exchange for the potential benefits. Broad areas of the country have the potential for prescribed fire use based on their natural fire regime, vegetation, and level of human development. National maps of potential for prescribed fire use were developed in both forested and non-forested systems based on vegetation, historical fire regime, and land cover. These maps provide a baseline from which further opportunities for use were explored. Emphasis is on broad-scale application of prescribed fire, focusing on counties where a significant portion of each county has the potential for prescribed fire use. Specific local concerns such as smoke management, cost, or environmental issues that might limit or constrain prescribed fire use were not considered. Conversely, local issues that might call for prescribed fire use on a more limited basis were not analyzed. 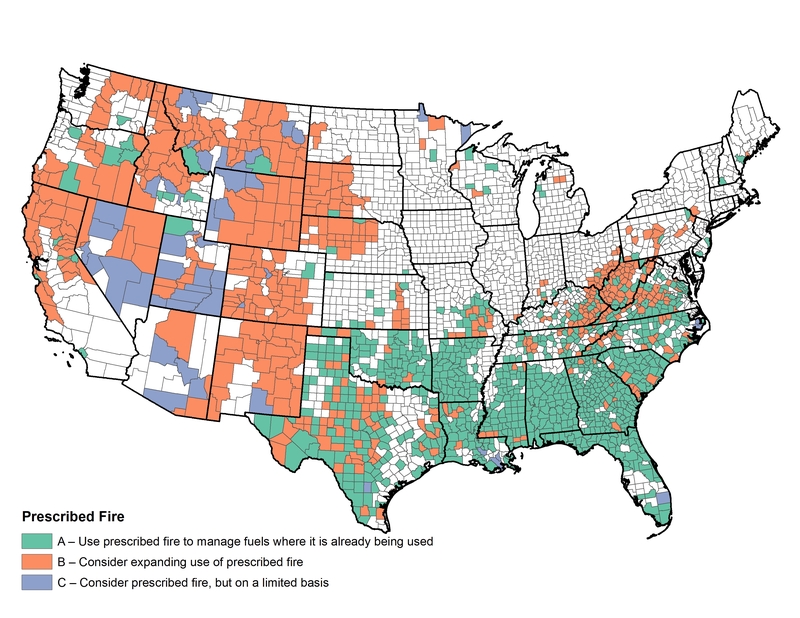 Data explanation: There is known prescribed fire activity in these counties and potential for forested or non-forested prescribed fire [Rx fire >0 and Forest Rx fire potential or Non Forest Rx fire potential >20%]. 1.a: Use prescribed fire to manage fuels where it is already being used. One management opportunity for prescribed fire use is to maintain or expand its application in areas where it currently is used (Option 1.a, figure 3.3). Fire management specialists in these areas have the necessary training and experience to implement a prescribed fire program and the history of use suggests community acceptance and tolerance. The analysis of probable areas of prescribed fire use based on remotely sensed data and other reports indicate that many counties throughout the Southeast and scattered counties in the Northeast and West are substantively using prescribed fire. This option would build on that experience and expand its use where economically feasible and socially acceptable. Data explanation: There is no history of fire in these counties, but has high potential for fire in the future [Sum of Fire and Non-Fire Rx potential >60% and Prescribed Fire <1]. 1.b: Consider expanding use of prescribed fire. A second opportunity is to expand into areas with prescribed fire potential, yet evidence of current, widespread application is lacking (Option 1.b, figure 3.3). These include many areas in the West as well as counties in the central Appalachians. Implementing prescribed fire regimes in these regions likely will require additional training and resources, as well as outreach and coordination with the communities that are most likely to be affected. Environmental constraints, especially in rangeland systems with invasive species (e.g., cheatgrass) or critical wildlife habitat, will have to be considered and addressed appropriately, as will the economic costs of introducing prescribed fire in more challenging areas. 1.c: Consider prescribed fire, but on a limited basis. The third opportunity (Option 1.c, figure 3.3) includes counties that have areas with potential for prescribed fire, but perhaps not to the extent as in Options 1.a or 1.b. As an example, these include counties where a smaller proportion of the total county area is suitable for prescribed fire, but it generally occurs in remote areas in large contiguous blocks. These include western counties with areas of low road density and where more than 25 percent of the total county area is suitable for prescribed fire. Remoteness presents the advantage of possibly fewer conflicts with human communities, but the disadvantage of potentially higher application costs and difficulty of control. Conclusion: Prescribed fire is a useful tool with potential for widespread increased application. Three possible options are identified, which collectively total approximately 55 percent of the land area of the conterminous 48 states. Considerations for application of prescribed fire and public acceptance of the use of prescribed fire as a tool vary nationally. Prescribed fire has inherent risks, such as the potential to human health and safety, which must be considered at the local level and may limit application.